click image for close-up In the summer of 1811, twenty-three-year-old Pavel Svinin arrived in Philadelphia to serve as secretary to the Russian consul. When he departed two years later, he had amassed a collection of 52 watercolors, which he intended to use as illustrations for his travel memoirs about the United States. Fourteen of the images were purchased from John Lewis Krimmel, a young German immigrant who painted images of street life in Philadelphia, including Black People's Prayer Meeting, a caricature of a Methodist religious service. In 1930, Svinin's portfolio was discovered and brought to the attention of Avrahm Yarmolinsky, a New York Public Library curator, who included engravings of all 52 pictures in his book on Svinin's life. Although the works were attributed to Svinin, who was himself an amateur artist, the body of evidence suggests that thirteen of the original illustrations were works by Krimmel, rather than copies painted by Svinin. The text of Svinin's memoir describes a dimly lit, dilapidated hall in which black worshippers "leapt and swayed in every direction and dashed themselves to the ground, pounding with hands and feet, gnashing their teeth, all to show that the evil spirit was departing from them." The unfinished painting shows a minister standing in the doorway of a sunlit, well-kept church, exhorting the congregation gathered outside. 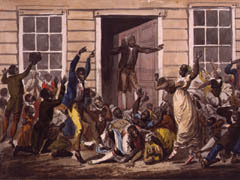 While exaggerated, "Black People's Prayer Meeting" did manage to convey the emotional intensity of the Methodist church. Like other Krimmel paintings, it drew on contemporary stereotypes of black appearance and behavior. In or out of church, whites and many black religious leaders regarded such displays as degenerate, and most of Philadelphia's major churches began to discourage such behavior as detrimental to their efforts toward greater respectability.